Over the years, regulatory authorities have reduced the frequency and scope of their examinations to control escalating costs. While authorities are reducing the depth of their examinations, they are stressing the need for banks, lenders, investors and insurance companies to utilize a comprehensive risk management program. We have witnessed record levels of delinquencies, foreclosures, mortgage fraud, ethical issues, imprudent underwriting and breaches of contractual representations and warranties which precipitated the outbreak of the current economic recession. The spate and magnitude of recently witnessed putbacks has accelerated the need and created a sense of urgency to forensically review the loan files to establish the documents’ adequacy, consistency and authenticity. 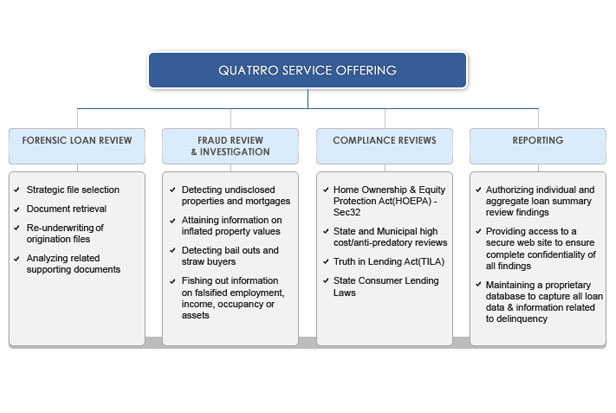 Quatrro, with its suite of varied financial services, is fully equipped to match the needs of Banks, Lenders, Investors, Monoline Insurers, Mortgage Insurance Companies, Trustees, Certificate holders, Federal Home Loan Banks, and Law Firms to accomplish their loan review requirements. In addition, the bank’s regulators and internal/external auditors will gain the benefit of Quatrro’s findings and recommendations through periodic reviews on delinquent as well as newly-booked loans. Establishing the actual amout of putbacks will require loan-by-loan review after uploading the files into a common workflow platform and then indexing any disorganized loan files. Quatrro tailors each loan review to its client’s specific requirements. Our global loan review analysts will review each document from end-to-end to provide the required analysis. Highlighted below is a general outline of how Quatrro assesses overall loan portfolio quality. Reduce duplications check to validate background, nature of business, history with the bank, credit reports, D&B reports, etc.